CD 1: 01. Pharoah Sanders Interview: Coming to New York; 02. Cocktail Piece [First Variation, Take 1]; 03. Cocktail Piece [First Variation, Take 2]; 04. Studio Engineer Announcement ; 05. Cherry's Dilemma; 06. Studio Engineer Announcement; 07. Remembrance [First Variation]; 08. Medley: Light Blue/Coming on the Hudson/Bye-Ya/Ruby My Dear/Embassy Music; 09. Don Cherry Interview: Ornette's Influence, Pt. 1; 10. Don Cherry Interview: Ornette's Influence, Pt. 2; 11. Paul Bley Interview: 1960's Avant Garde; 12. Generous, Pt. 1 [Take][Take 1]; 13. Generous, Pt. 1 [Take][Take 2]; 14. Walking Woman [Take][Take 1]; 15. Walking Woman [Take][Take 2]; 16. Ictus; 17. After Session Conversation. CD 2: 01. Pharoah Sanders Interview: Musicians He Performed With, Pt. 1; 02. Bernard Stollman Interview: Meetin Pharoah Sanders; 03. Seven By Seven ; 04. Bethera; 05. Pharoah Sanders Interview: Musicians He Performed With, Pt. 2. CD 3: 01. 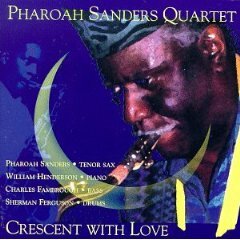 Pharoah Sanders Interview: Meeting Sun Ra; 02. Dawn Over Israel; 03. The Shadow World; 04. The Second Stop Is Jupiter; 05. Discipline #9; 06. We Travel the Spaceways. CD 4: 01. Sun Ra Interview: Being Neglected as an Artist; 02. Gods on Safari; 03. The Shadow World; 04. Rocket #9; 05. The Voice of Pan, Pt. 1; 06. Dawn Over Israel; 07. Space Mates; 08. The Voice of Pan, Pt. 2; 09. The Talking Drum; 10. Conversation With Saturn; 11. The Next Stop Mars; 12. The Second Stop Is Jupiter; 13. Pathway to the Outer Known; 14. Sun Ran Interview: Meeting John Coltrane; 15. Pharoah Sanders Interview: John Coltrane; 16. Pharoah Sanders Interview: Playing at Slug's/Max Gordon; 17. Pharoah Sanders Interview: Closing Comments. Pharoah Sanders (sax tenore) con: The Don Cherry Quintet: Don Cherry (cornetta e pianoforte); Joe Scianni (pianoforte); David Izenzon (contrabbasso); J. C. Moses (batteria); The Paul Bley Quartet: Paul Bley (piano); David Izenzon (contrabbasso); Paul Motian (batteria); The Pharoah Sanders Quintet: Stan Foster (tromba); Jane Getz (piano); William Bennett (contrabbasso); Marvin Pattillo (batteria); Sun Ra and his Solar Artkestra: Sun Ra (piano e celeste); Black Harold (flauto e percussioni); Al Evans (tromba); Teddy Nance (trombone); Marshall Allen (sax alto, flauto, percussioni); Pat Patrick (sax baritono); Alan Silva e Ronnie Boykins (contrabbasso); Clifford Jarvis e Jimmhi Johnson (batteria); Art Jenkins-Space (voce).